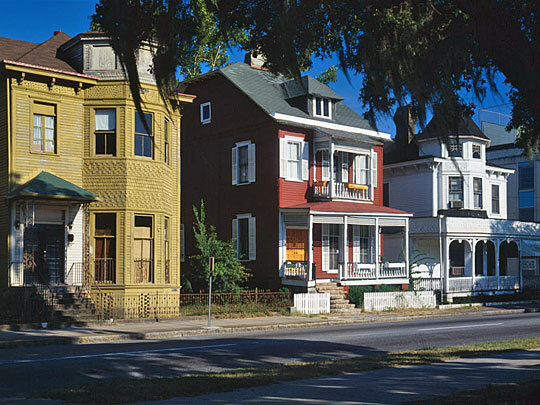 Photo: Drayton Street, Savannah Victorian Historic District, Savannah, GA. Listed on the National Register of Historic Places in 1972. Photographed by Walter Smalling, Jr., Historic American Buildings Survey [HABS GA-1169], memory.loc.gov, accessed November, 2013. Chatham County administrative offices are located at 124 Bull Street, Savannah GA 31401; phone: 912-652-7869. Chatham County is located on the southeast coast of Georgia. Comprising the state's northernmost coastal area, at the mouth of the Savannah River, Chatham County includes the site on which General James Edward Oglethorpe landed in 1733 to establish the Georgia Colony. There are eight municipalities within the County: Savannah (county seat), Bloomingdale, Garden City, Pooler, Port Wentworth, Thunderbolt, Tybee Island and Vernonburg. The 2000 Census reported a county population of 232,048 residents. The name Savannah was chosen by Oglethorpe and the Trustees for the Establishment of the Colony of Georgia in America. Oglethorpe and the Trustees devised an elaborate plan for the town based on wards of approximately 10 acres with squares at the center. Savannah's National Historic Landmark District and eight other historic districts encompass an area of 3.3 square miles with more than 6,000 architecturally significant buildings. Savannah has a vibrant and diverse economy that is especially strong in areas of trade, services, and tourism. Chatham County Board of Commissioners, Chatham County Comprehensive Plan, 2006, www.thempc.org, accessed June 2009.